Advantages of Remote Sensors - Remote sensors provide multiple advantages. By connecting the high and low side transducers at the point of measurement instead of running copper piping back to the transducer, the labor and material costs are cut by one-third. All Inclusive Field Selectable Design - The 231RS has a multi-configurable design, providing the user with field selectable ranges and outputs as well as push button or remote zero. The flexible design gives the user total flexibility to make changes on the job site. Multiple Connector Options for Added Flexibility - The 231RS offers remote sensors that connect to the unit via armored jacket, cable or conduit fitting available in 10, 20, 30, 40 and 50 foot lengths. 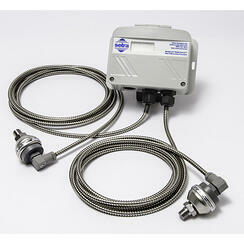 With the remote sensors, there is no need for a 3 or 5 valve manifold and no risk to compromising the electronics. Display Options Available - The 231RS has an optional LCD display which gives the user the ability to view the high, low and differential pressure outputs locally at the device. The visual indicator gives instant feedback providing validation to the user.